The Envira Amazonia Project involves numerous local and international partners that will collectively protect nearly 500,000 acres in the Amazon Rainforest – the world’s largest rainforest – from conversion to large-scale cattle ranches and prevent millions of tonnes of greenhouse gas emissions. Avoided deforestation projects are critical because about 15 percent of global warming is attributed to deforestation, which reduces the Earth’s capacity to absorb carbon dioxide. Moreover, fallen trees decompose and release methane, a heat-trapping gas about 23 times more potent than CO2. 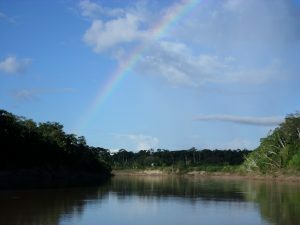 The Envira Amazonia Project is now being reviewed for its second verification to the Verified Carbon Standard (VCS) and the Climate, Community and Biodiversity Standard (CCBS) with Gold Distinction for exceptional biodiversity and community benefits, along with Gold Distinction for climate change adaptation measures. The Envira Amazonia Project is a Reducing Emissions from Deforestation and Degradation (REDD+) project that shall mitigate deforestation, preserve extraordinary biodiversity, and provide alternative economic opportunities to local communities. Social projects and activities to mitigate deforestation pressures and benefit the local communities include, but are not limited to: agricultural extension training courses; boat patrols of potential deforestation sites; improving local schools and health clinics; and developing local infrastructure to collect, transport and sell locally-sourced açaí, medicinal plants and rubber. The Envira Amazonia Project is also providing a variety of essential ecosystem services such as: erosion and flood control; water cycling, filtration and storage; oxygen production and nutrient recycling; and habitat for thousands of native Amazonian plant and animal species including several vulnerable tree species and numerous endemic bird species.